A stylish, comfortable trullo in a superb location and with a great pool. Trullo Terra Dolce (literally, "Sweet Earth") is a beautifully restored collection of original trulli, set in the rolling olive groves, and with far reaching views, of the soothing Valle d'Itria countryside. The sensitive restoration has comfort in mind in the form of superb fittings and underfloor climate control, and great style in the choice of materials and furnishings. This is a flexible property that will suit many group formations, from families to groups of friends. 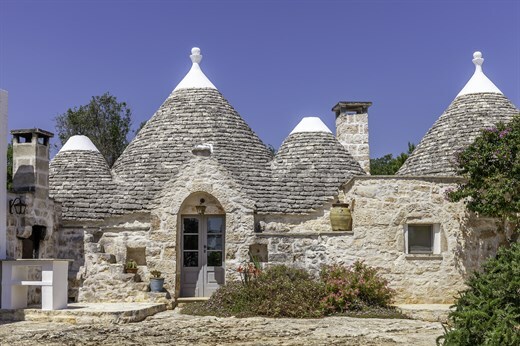 Inside: accommodation at Trullo Terra Dolce is spread over three independently accessed houses which, whilst resembling a single building from the outside, are not connected internally. The "main house" is nearest to the pool and has a comfortable open-plan living and dining room with large glass doors offering stunning views over the gardens and pool, a well-equipped kitchen, also with garden access, one double bedroom with an alcove bed and an en-suite bathroom with tub and rainfall shower, a study with an ornamental daybed and a second bathroom. The middle of the three houses is a classic trullo and is home to a double bedroom (with bed in an alcove) and an en-suite shower room. The third house, furthest from the pool, comprises two bedrooms, a double and a double-twin and two shower rooms (of which one en-suite), a living room with access to the gardens and an al fresco dining and lounge area, a dining room with original bread oven and a kitchen. The properties have been beautifully restored to a very high quality and subtly brought into the 21st century: many of the original features have been retained, some fulfilling their original function, others being ingeniously put to other uses. Traditional Puglian and exotic Indian furniture and furnishings combine to create a bright, cheery atmosphere throughout, while the bathrooms combine contemporary-style suites with original stone-carved wash basins. a. if you book as a couple (i.e. 1 bedroom) you will be accommodated in the main house. Outside: Trullo Terra Dolce is surrounded by extensive gardens and terraces with a selection of shady spots for al fresco living and dining. Green lawns alternate with paved areas and all has been planted with a large variety of colourful and fragrant Mediterranean flora. The focal point, however, is the splendid pool, from which views over the surrounding woods (accessible from the gardens) and gentle countryside are delightful. Whether you book just the main house or all the property, you will always have exclusive use of the ground and pool. Trullo Terra Dolce is situated at the southern end of the Valle d'Itria between Ostuni, a beautifully restored baroque town with stunning panoramic views, and the pretty centre of Ceglie Messapica. The Valle d'Itria, however, is probably best known for its trulli, and nowhere are these more in evidence than in the picture-postcard town of Alberobello. Locorotondo, Cisternino and Martina Franca are also well worth a visit. If you are looking for beaches, the Adriatic coast offers endless stretches of sand and some well recommended lidos from which to enjoy it. Further afield, Lecce, Gallipoli, Otranto and Monopoli are justly famous towns waiting for you to unlock their secrets. "The highlight of our holiday was the fabulous villa and beautiful pool. It felt as if we were staying in a home. We spent most of this trip enjoying the beautiful villa and its surroundings." What a memorable family holiday we all had at Trullo Terra Dolce! The grounds are so beautiful. Our 5-year old grand-daughter summed it up when she said it was sad to leave Trullo Terra Dolce. It was her first overseas trip, but she and her 8-year old brother loved the villa. The place was just as enjoyable for us and our sons and daughters-in-law. The in-villa pizza cooked in the wood-fire outdoor oven on the night we arrived was the perfect beginning to our holiday. We were tired from our long flights and it was a Canadian holiday, Thanksgiving. We may do pizza from now on for Thanksgiving as reminder of our family trip to Puglia! We absolutely loved Trullo Terra Dolce. Its was beautiful, the interior with all the fabulous ceramics incredible. The views, grounds and pool all exceeded expectations. We loved the home touches in Trullo Terra Dolce, the owner's pottery and art, the abundance of quality towels, the homemade marmalade. The pool was exquisite, the best pool I have ever had the pleasure of swimming in. Being a swimmer, this was a treat to wake up to every morning. Beautiful memories of cutting fresh flowers for the table from the lovely gardens. Family table tennis tournaments on the wonderful built in stone table. We did some great sightseeing but the best part of the day was opening the electric gates upon our return to Trullo Terra Dolce. The garden at Trullo Terra Dolce was a delight and having rich lush lawn was an oasis...we really appreciated it. The furnishings and decoration had just the right touch of colour, rusticity and artfulness without being twee. We loved Trullo Terra Dolce. We had the in-villa cooks to cook us several pizzas on our last night using the villa's pizza oven which was amazing, delicious pizzas. The pottery used in the villa was a great feature as it was made by the owner. The villa and garden exceeded our expectations. The staff were excellent and helpful. Trullo Terra Dolce was truly outstanding, with luxurious accommodation - everything and more we could have hoped for. The local team were extremely helpful, yet discrete, during our stay and made all of us feel very welcome and relaxed. We look forward to returning one day and spending more time in such a beautiful home. We enjoyed absolutely everything about Puglia! The accommodation and facilities were excellent, great food and wine and spectacular towns and villages. Trullo Terra Dolce was beautiful. The highlight was the fabulous villa and beautiful pool. It felt as if we were staying in a home and enhanced by the owner's ceramics and fantastic eye for design. We spent most of this trip enjoying the beautiful villa and its surroundings. The owner was delightful and the housekeeper was so friendly and most helpful. Trullo Terra Dolce was wonderful, one of the most enjoyable stays we have had. It has been beautifully restored and is well equipped to cater for any holidaymaker. We swam every day we were there and of an evening just enjoyed the beautiful surroundings and home cooking of the fresh produce available in any of the towns and villages close by. We would certainly like to return in the future. A wonderfully individual and homely Trullo, I would visit again. Loved the handmade pottery and beautiful gardens. Trullo Terra Dolce is a beautiful villa. Trullo Terra Dolce was the most beautiful villa we have ever rented. Staff and owner were so lovely and helpful. We had a gorgeous very quiet and relaxing week. Trullo Terra Dolce is well-equipped with a great sense of homeliness. What a privilege to stay in such a beautiful place. I have never had self catering which was so well provisioned - every need was anticipated and catered for. The mid-week clean of villa and pool was appreciated as well as the abundant supplies of towels. I loved the whole experience. It was just brilliant to bring all of our family together in a place that was private and spacious. The separate buildings within the complex gave everyone flexibility of being alone of together with the group and we had spontaneous meals where we brought food from both the kitchens. We pre-booked wine which was there waiting for us. Good quality and much enjoyed by all. We also felt more relaxed on our outward travel knowing that Laura would cook us pizza in the evening - so we arrived to wine and excellent pizza - a real holiday pleasure which we remember for ever. The owners, house manager and your Local Manager, Tamara, were all incredible! We especially loved the proximity to so many interesting towns and sites--all within a day trip from the house. The variety and calibre of the local restaurants was extraordinary. We enjoyed the peaceful and beautiful environment, the nature around the house, the house was gorgeous and decorated with great taste and in in perfect condition. Entertainment (videos, music) available in the house was awesome. It was truly a wonderful experience... We had a great time in the villa. The only problem was that it was so nice to stay in the villa that we didn't feel like going out. We found we spent more and more time at the villa as days went by. Villa was beautiful. Immaculate and stylish inside and very well dressed. The grounds and pool were stunning. Loved Puglia, loved the Trullo... In-villa cook was excellent on our arrival night. It was a great way to start the holiday. Magnificent and tastefully furnished property, beautiful grounds, very helpful and charming local caretaker; fantastic overall experience... One of the nicest houses that I have seen in a magnificent part of Italy. Overall a very enjoyable property. Fantastic property! We liked it so much that we plan on purchasing a trullo in Puglia!... Antine (our Local Manager in Puglia) has been OUTSTANDING and above expectations. Ein tolle Villa mit traumhafter Aussenanlage. Hier hatten wir (ausser dem Wetter - daher konnten wir den Aussenbereich wenig nutzen) eine perfekte Woche. Alles sehr mit Liebe zum Detail ausgesucht und topgepflegt (sicherlich auch daher, dass die Eigentümer sich persönlich darum kümmern). Mit denen hatten wir dann auch einen sehr lustigen Nachmittag verbracht. Absolut empfehlenswert und hier würden wir auch wiederkehren. Nous avons passé un excellent séjour à Terra Dolce. Les propriétaires sont adorables... Le four à pizza à fait l'unanimité ainsi que Sarah et Laura les deux cuisinières. Un vrai plus pour cette maison.